Adam Bien’s Porcupine library makes it easy to configure dedicated executor services that act as application bulkheads. I’ve created an extension that exposes the Porcupine statistics via MicroProfile Metrics. We can furthermore make the instrumentation visible via Prometheus and Grafana dashboards. Instead of using MicroProfile Metrics or this extension you can equally well expose the metrics via other mechanisms, for example by using the Prometheus Java API as explained here. Afterwards, we scrape the exposed metrics via Prometheus and create Grafana dashboards that query and display the statistics, dynamically for each pipeline via variables. 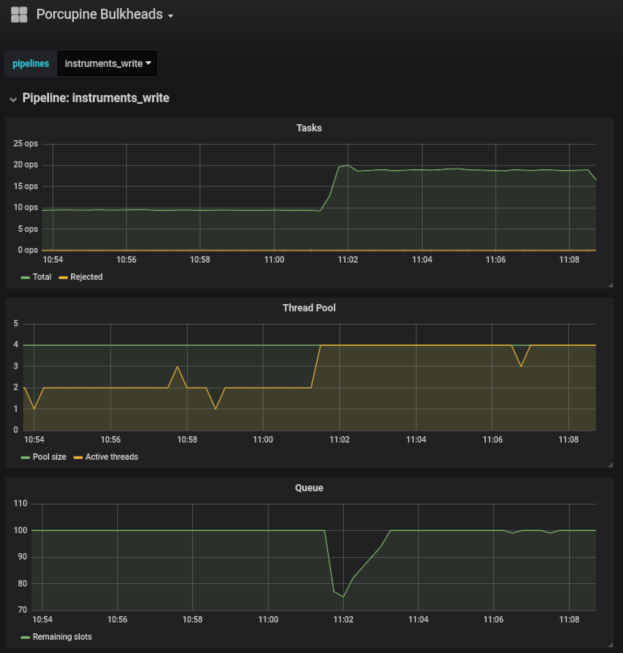 To get started, I’ve shared the Porcupine dashboard similar to what you see on the screenshot on Grafana.com that connects to a Prometheus datasource. You can have a look at the instrument-craft-shop project that uses Porcupine Metrics. In case you’re wondering why I’m using Porcupine instead of the MicroProfile Fault Tolerance bulkheads, have a look at the following video on bulkheads and backpressure with Java EE.